I probably won't post too many more recipes but this one was fun to make and I found it interesting in terms of incorporating lots of different flavours into the finished beer. Pumpkin beers for me can be hit and miss. I've tried a few US examples and liked some but not others. They're sometimes a bit too sweet for the underlying style, focusing more on what people make with pumpkin flavouring (sweets, pies etc.) than its naturally earthy, slightly sweet characteristics. When thinking about what to make with it, I did get sucked in to the pumpkin pie idea, mostly because I think cinnamon is quite complementary. Vanilla is another flavour that works well, which got me thinking about Bourbon. In trying to mash this all together, I started searching for pie recipes and came across this one, which looks most appealing! The only oddity used on brew day was the pumpkin. My local supermarket hadn't yet started to stock the real thing. However, we do have an American candy store nearby and they carry the tinned stuff, so I decided to use that instead, boiling it for the final 10 minutes. The OG was 1.089 and while a couple of packs of Wyeast 1056 set about working their magic, I started to think about the other flavours I wanted to impart and how best to do that without ending up with something with too much of one flavour and not enough of another. To get the cinnamon and nutmeg in cleanly without adding them to the beer itself, I took the option of infusing them into the Bourbon. My (now almost empty) bottle of Maker's Mark was drained of 100ml of the good stuff, into which I added two teaspoons of ground cinnamon and two grated nutmegs. This was left for 10 days, with regular shakes to maximise the infusion. The Bourbon turned a lovely deep red colour! For the vanilla flavour, I opted for a bottle of Nielsen-Massey Pure Vanilla Extract bought from the supermarket. 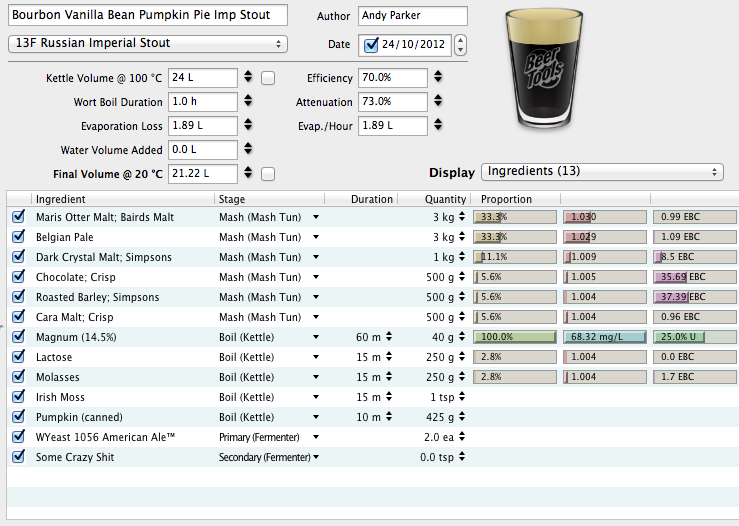 The beer finished at 1.024, making it 8.6%ABV. With my infused Bourbon and bottle of vanilla in hand, I played about a bit with ratios before settling on 50ml of both into the final beer. The beer was then batch primed for 1.9 volumes of CO2 and packaged in 330ml bottles. Now to bake that pie! Thats a hefty amount of Choc & Roast for an Imperial full on liquorice & boot leather, what sort of EBC did it predict? I like 'em full on! With this one it also meant I could add a lot of flavour in secondary without overwhelming the underlying beer. Predicted EBC was 86. Being honest, tasting the finished beer afterwards I would dial the roastiness back a touch if brewing again. Worried about it being too sweet and ended up with something being not quite sweet enough. I've always gone by the EBC calculated by BeerEngine and I think BrewMate underestimates colour significantly, I would expect your recipe in BeerEngine to be over 300ebc... blacker than thou!